There will be no ARRL Audio News this week. The ARRL Audio News will return September 8. ARRL Emergency Preparedness Assistant Ken Bailey, K1FUG (left) and ARRL Field Organization Supervisor Steve Ewald, WV1X, monitor traffic nets at W1AW during Hurricane Irene. Irene first made landfall in the US as a Category 1 storm on the morning of Saturday, August 27 on North Carolina's Outer Banks. In preparation, ARRL Emergency Preparedness Manager Mike Corey, W5MPC, activated the ARRL HQ Emergency Response Team (HQERT). On Tuesday, August 23, this team of ARRL HQ staffers began monitoring various nets and providing support to the affected Field Organizations from W1AW, the Hiram Percy Maxim Memorial Station. Two days later, the HQERT went into active mode. Read more here. When Tropical Storm Irene formed on the evening of Saturday, August 20, the Puerto Rico Emergency Management Agency began to activate in preparation for the storm's approach. 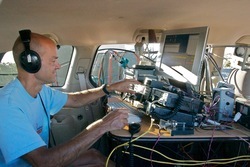 According to ARRL Public Information Officer Angel Santana, WP3GW, amateurs affiliated with the Cuerpo Voluntarios Radioaficionados (CVR) began to move throughout the island. In San Juan, CVR activated KP4CVR on the KP4CAR repeater. 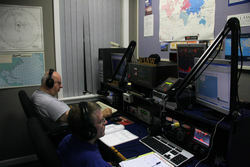 Hams also monitored 7.195 MHz for traffic and used 146.520 MHz for local contacts. Read more here. 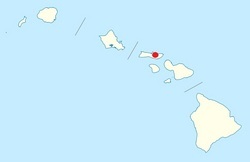 The Kalaupapa Peninsula (as seen by the red dot) -- located on the island Molokai in Hawaii -- was the site of the second remote VE testing administered by the ARRL. From the sunny shores of Hawaii's Kalaupapa Peninsula, -- located on the Island of Molokai -- ARRL Volunteer Examiners gave a remote ARRL VE session on the morning of July 25. Well, at least it was morning in Hawaii, but it was late in the afternoon at ARRL Headquarters. What made this VE session so special that it was only the second VE session to be administered via Internet video feed. The first video VE session -- and the first-ever VE session in Antarctica -- took place in October 2010. Not only was this VE session special due to its location, only one VE was at Kalaupapa for the exam. "This is where the Internet video feed came into play," explained ARRL VEC Manager Maria Somma, AB1FM. "Joe Speroni, AH0A -- who lives in Honolulu but went to the site at his own expense -- was at Kalaupapa, but Bev Yuen, AH6NF, and Ray Moody, AH6LT, were in Honolulu and watching on video. We also had three VEs here at ARRL Headquarters watching via video feed: Penny Harts, N1NAG, Steve Ewald, NV1X, and Rose Anne Lawrence, KB1DMW. These three administer many VE sessions each year here at ARRL HQ." Read more here. September is here, and that means the VHF bands have been getting a workout. "If you've never experienced the fun of VHF+ operating, the ARRL September VHF QSO Party, the weekend of September 10 is a great place to start," said ARRL Contest Branch Manager Sean Kutzko, KX9X. "With many HF radios now offering at least 6 meter SSB/CW capabilities -- and some offering 2 meters and 70 cm as well -- any amateur with a Technician class license or higher can experience long-haul communication on the VHF bands." Kutzko explained that September is known for having good tropospheric propagation, as opposed to June, which is known for sporadic-E, or E-skip. "As the summer winds down, the sporadic-E season comes to an end and good tropo conditions flourish," he said. "A modest station -- say a 50 to 100 W SSB/CW transceiver and a small Yagi on 2 meters -- can, with favorable conditions, make QSOs several hundred miles away. If conditions are excellent, QSOs of more than 1000 miles are possible." Read more here. In remembrance of those who died in the terrorist attacks that occurred on September 11, 2001, several Amateur Radio Special Event Stations are being planned. Click here for a list of those stations that have notified the ARRL that they will be on the air. The dates, times and frequencies of these Special Event Stations are listed as they were reported to the ARRL, and as such, are subject to change. This list will be updated as more Special Event Stations notify ARRL HQ of their plans. We recommend that you bookmark the web page and check back periodically for any additions. The Sun, as seen on Thursday, September 1, 2011 from NASA's SOHO Extreme Ultraviolet Imaging Telescope. This MDI (Michelson Doppler Imager) image was taken in the continuum near the Ni I 6768 Angstrom line. The most prominent features are the sunspots. This is very much how the Sun looks in the visible range of the spectrum. 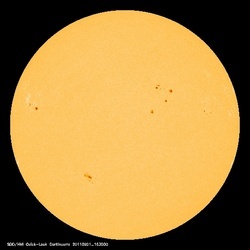 Tad "September Sun, blowing golden hair" Cook, K7RA, reports: Sunspot activity rose again this week, with the average daily sunspot number up nearly 18 points to 83.6, but the geomagnetic indices were down slightly. The high sunspot number for the week -- 121 -- was recorded on Wednesday, August 31. The last time the sunspot number was higher was on July 31 at 128 and August 1 at 130. The predicted solar flux is 110 on September 1-2, 105 on September 3, 100 on September 4-5, 95, 90, 90, 85, 90, 92 and 95 on September 6-12, 100 on September 13-15, and finally peaking at 105 on September 18-22. The predicted planetary A index is 5 on September 1-2, 8 on September 3-4, 5 on September 5-10, and then 8, 12, 8 and 5 on September 11-14. Look for more information on the ARRL website on Friday, September 2. For more information concerning radio propagation, visit the ARRL Technical Information Service Propagation page. This week's "Tad Cookism" is brought to you by Type O Negative's September Sun. ARRL Headquarters will be closed in observance of Labor Day on Monday, September 5. There will be no W1AW bulletin or code practice transmissions that day. ARRL Headquarters will reopen Tuesday, September 6 at 8 AM Eastern Daylight Time. We wish everyone a safe and festive holiday weekend.